Think of it as August Rush flavored neorealism in the wondrous crowd pleaser Under the Same Moon that, in its Sundance Film Festival premiere, received a standing ovation from the audience. Making her feature film debut, director Patricia Riggen, working from a script by “Go, Diego! Go!” writer Ligiah Villalobos follows Carlitos (Adrian Alonso), a young, precocious boy who, just after his ninth birthday decides to make the risky and increasingly dangerous illegal journey from Mexico to East Los Angeles on his own in order to reunite with his mother (Kate del Castillo). 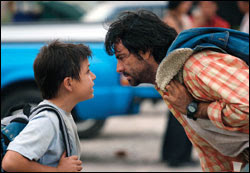 After a rocky start hiding in the vehicle driven by college students America Ferrera and Jesse Garcia, he soon makes the unlikely acquaintance of Enrique (Eugenio Derbez), who like the elderly woman in Salles’ Central Station, is a rough around the edges, grumpy sort who finds their heart melting around the adorable child. While it’s the gifted young Alonso who captures the affection of the audience from the get-go, it’s ultimately Derbez who is the film’s most valuable asset, turning in a tough, convincing and layered performance that may have easily ventured over in the land of camp or as a one-note portrayal. The travels of Carlitos are intercut with the story of his struggling single mother Rosario, who, beautiful and hardworking, cleans houses for wealthy white employers to try and give her son a better life and has come to the crossroads of her life in trying to figure out if she should return home or make her citizenship legal by marrying the handsome and sensitive Paco (Gabriel Porras) who has long had a romantic interest in Rosario. With plenty of dramatic heartbreak and missed connections along the way, Under the Same Moon, much like its tiny hero Carlitos, journeys onward to an emotional conclusion guaranteed to make even the most hardened viewer blink back a few tears. While there’s a definite political undercurrent to the topical tale of illegal immigration in Riggen’s film, it’s never heavy handed and takes the lofty stance of character driven plot to illuminate the struggle and even for those who may disagree with the border crossing, one cannot deny the relatable story of a child going to great lengths to reunite with a mother who in return has gone to great lengths to take care of her son.